Magnetic resonance imaging (MRI) has led to the identification of widespread brain abnormalities in multiple sclerosis (MS) that extend far beyond the classic white matter lesion. These findings have generated the idea that MS should be understood as a disease of the whole brain, not just the white matter. While it is no doubt the case that many different pathways are ultimately involved in the destruction of brain tissue that occurs in MS, the implications of the accumulated evidence for understanding disease pathophysiology – and hence the overall significance of these imaging findings – are doubtful. Here, I argue that the principled use of imaging can, in fact, address questions about the genesis of these whole-brain abnormalities, rather than simply describe them. Kafka once said “follow your most intense obsessions mercilessly”. This applies more to MRI researchers than any other researcher I have met; waiting for that elusive acquisition that can best capture MS, in a self-enclosed totalitarian ideology. Daniel Reich (below) candidly explains this in his paper, what he calls the post-lesional era in MRI: “the brain atrophies at a remarkable rate over the course of the disease (i.e. the disease is not wholly captured by the MRI); MRI as currently implemented, is not pathologically specific, or at least not usefully so (as a neurologist it’s up to you to decide the relevance of the scan); and the accepted clinical phenotypes of MS are not separable by MRI (no explanation needed for this one; you realize, the more PwMS you see, the more varied their scans“). Danny Reich visiting the Blizard in June this year. The paradox is that which we are not seeing with the MRI (Barkhof and Goodwin demonstrate that MRI lesion number and volume can only capture 30% of clinical MS). But is a more detailed scan going to answer this? Most definitely, according to Reich. 7-Tesla scans (majority of clinical scans are currently 3T resolution) provide more detailed images, which will permit better radio-pathological correlates to be performed, such as the partially remyelinated shadow plaques, for example. Interestingly, there is burgeoning work looking at the perivenular topography of MS lesions which can inform more about the pathophysiology of lesion formation and evolution (see Fig below). 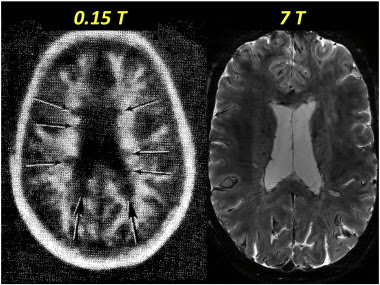 Figure: left first published MRI scan of a PwMS (the arrow points to hypointense lesions compared to the surrounding white matter), right 7T* image demonstrating hyperintense lesions with central hypointense veins which are diagnostically useful and not seen in small vessel ischaemic lesions. What I believe MRI is, is a fingerprint of the brain at a certain point in time. 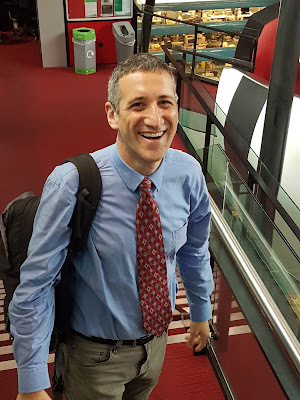 What it isn’t is the answer to what many allude to as “a true relapse”, or a correlate of the myriad of pathological processes that underly MS, including inflammation, demyelination, neurodegeneration, synpatogenesis and regeneration. Some may disagree. I'm obsessing on that time lapse of the brain MRI. Disease activity doesn't even really take off until the subject is 60. The idea that MS burns out with age is pretty much a lie, isn't it?